Ritchie makes The Man From U.N.C.L.E. campy and fun, while throwing in big stunts and explosions similar to his other films. The action and story flow well and the picturesque shots are breathtaking. 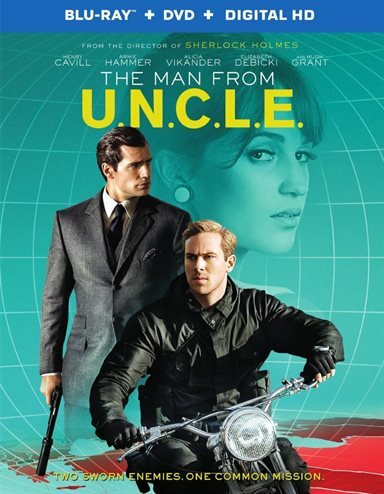 I wasn't alive when the popular television show The Man From U.N.C.L.E. aired so I have no basis of comparison with the 2015 movie. However, Warner Bros. decided it was time to make a full-length feature film that, I can only imagine, pays homage to the series. If nothing else, it is a fun look at the spy game from years ago reminiscent of another tv show, Get Smart. Gaby (Alicia Vikander; Ex Machina) is living in East Germany in the Cold war era of the 1960. Working as a mechanic, she is stuck behind the wall as various factions search for her father, a scientist who created a bomb. Solo (Henry Cavill; Superman) is a criminal turned CIA agent sent to retrieve Gaby and bring her to West Germany. Illya (Armie Hammer; The Social Network) is the Russian KGB spy sent to stop Solo from rescuing Gaby. Victoria (Elizabeth Debicki; The Great Gatsby) is the evil heiress holding Gaby's father hostage in order to make him finish his bomb allowing her to sell it to the highest bidder. Once Solo succeeds and Gaby is safely in West Germany, the CIA and KGB end up working together to try and get the bomb and stop Victoria. Solo, Illya, and Gaby go undercover in Italy to infiltrate Victoria's network in order to save Gaby's father. Of course the distrust and awkwardness of these three working together is still there which makes their mission even harder. In the end though they save the day, Gaby and Illya fall in love and Solo and Illya become reluctant friends. Part of what makes this movie works is the cast. Cavill plays Solo suave and debonair a la James Bond. Gaby is innocent and streetwise all at once; endearing her to everyone she meets. Victoria is deliciously evil as the plotting rich woman steeped in money and power. Hammer is the best surprise as the Russian KGB Spy. His accent is smooth and not distracting and he plays the soldier in the Russian machine perfectly with just a hint of emotion bubbling to the surface every so often. This role is quiet a departure from his disastrous performance in The Lone Ranger and is a welcome change. The Blu-ray presented in the latest technology utilizing Dolby Atmos audio (Dobly TrueHD 7.1 losslesss) and 1080p High Definition video. Atmos is fantastic and the movie mixed beautifully which allows the viewer to be immersed in every aspect of the film. The video is a less in extremes from the drab grey world of 1906's Berlin to the opulent environs of Rome. The film is clearly a feast for the ears and eyes and audiences won't be disappointed in any aspect. While there aren't a lot of extras on the Blu-ray, the special features are well worth viewing. Spy vision takes a look at recreating the cool 1960's as the crew discusses the clothing styles, worldwide locations and numerous props. Motorcycle enthusiasts will love a look inside Metisse Motocycles as Hammer talks to the owner and takes a walk through their factory. Features on The Men in the film discuss Cavill and Hammer and a segment on Director Guy Ritchie (Sherlock Holmes) looks at what typevof person and director he is. Ritchie makes The Man From U.N.C.L.E. campy and fun, while throwing in big stunts and explosions similar to his other films. The action and story flow well and the picturesque shots are breathtaking. For those who remember the original series this film is probably a fun walk down memory lane. For younger generations is a fun, lighthearted look at a dark time in world history.